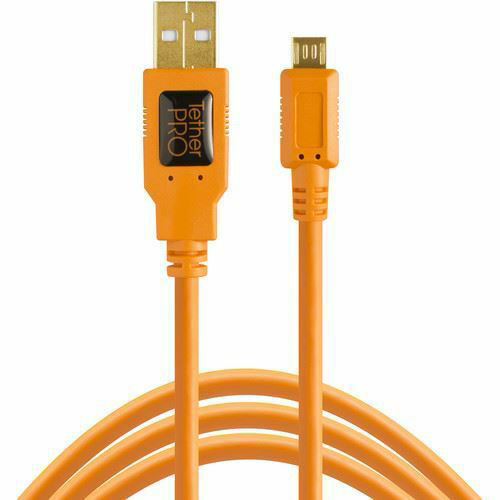 The 15', orange TetherPro USB 2.0 A Male to Micro-B 5-Pin Cable from Tether Tools connects to cameras, using a micro B 5-pin port. Its gold-plated connectors for corrosion resistance ensure consistent and reliable conductivity. The cable also features a reinforced ferrite core that filters signal noise and reduces transmission errors. A full-lined shielding protects against external signal interference. Box Dimensions (LxWxH) 6.4 x 6.3 x 1.6"